The Leaning Pile of Books is a feature where I discuss books I got over the last week—old or new, bought or received in the mail for review consideration (often these are unsolicited books from publishers). 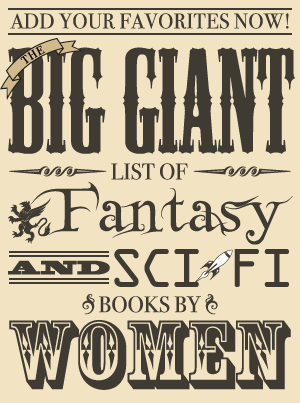 Since I hope you will find new books you’re interested in reading in these posts, I try to be as informative as possible. If I can find them, links to excerpts, author’s websites, and places where you can find more information on the book are included. Last week was a pretty good mail week with some very intriguing upcoming releases! The final installment in the Book of the Ancestor trilogy will be released on April 9, 2019 (hardcover and ebook). 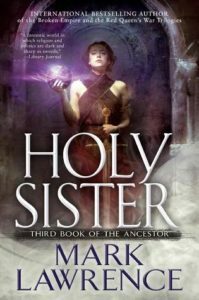 The third book in the thrilling and epic Book of the Ancestor trilogy from international bestselling author Mark Lawrence. 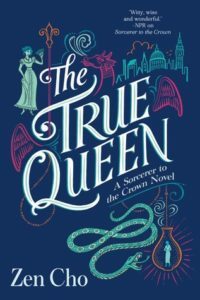 The True Queen, a new story set after events in Zen Cho’s Regency fantasy Sorcerer to the Crown, will be released on March 12, 2019 (trade paperback, ebook, audiobook). It appears to be too early for excerpts from the upcoming novel, but the publisher’s website does have an excerpt from Sorcerer to the Crown. My reaction to Sorcerer to the Crown was a complicated one—though I liked it and thought it was well done, it seemed like I should have loved it and I’m not quite sure why I didn’t—but I did enjoy it and am curious about this new tale set in the same world (and discovering what Prunella has been up to!). This anthology of stories set in Julie E. Czerneda’s Clan Chronicles universe (and edited by her!) will be released on December 4 (trade paperback, ebook). The editor’s website has more information on the book and the table of contents, which includes stories by Tanya Huff, Karina Sumner-Smith, Fiona Patton, Violette Malan, and more—plus a story about Sira and Morgan written by Julie E. Czerneda! The publisher’s website also has an excerpt from Tales from Plexis. Welcome to one of the iconic settings of the Clan Chronicles: the infamous interstellar shopping extravaganza of the Trade Pact known as Plexis Supermarket! A market and meeting place, Plexis is where pirates rub shoulders with freighter crews, where the rich come to party and the out-of-luck chase that last opportunity, where anything can be bought or sold and only your airtag tells the truth. Most of the time. Dock your starship, pay your parking fee, and enter. You’ll never know what you’ll find. Or who you’ll meet. 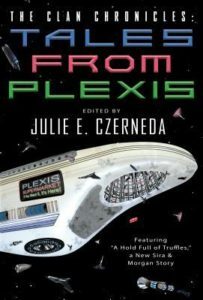 Because here, for the first time, Julie E. Czerneda has opened the airlocks to her fellow scribes and lovers of all things Trade Pact to produce this anthology of remarkable, all-original stories. Learn the beginnings (and kitchen secrets) of the famed Claws & Jaws: Interspecies Cuisine. Solve mysteries. Slip through service tunnels or shop with goldtags! Want the truth about Turrneds? The Neblokans? How Terk met his partner? More of Raj Plexis and Bowman? The way to Ansel’s heart? Kurr di Sarc. Huido. Manouya. Those balloons.